Much funnier than one might expect, this movie stays true to the one night party theme for most of the way through, and features so many colorful characters, it’s hard not to enjoy the trip. This is a fun movie with a very basic premise, but a whole lot of entertaining characters who keep this thing moving the entire time. The storyline is about a bank branch that is about to be closed down. There’s a deal they want to make and a client they want to close, and the boss tells them that if they can land the client, then they can stay opened. And so they go to work preparing and throwing the most elaborate office Christmas party imaginable, hoping if the client shows up and has a good time, he will sign with them. Not the most intelligent plot, but that’s okay, because as a comedy this thing works. 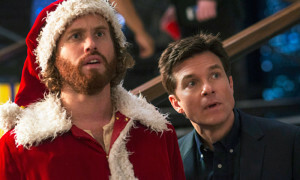 Jason Bateman leads a crew of hilarious idiots, including two different crazy, over-the-top characters, played by TJ Miller and Rob Cordry, (usually we only get one,) and a whole host of small storylines, most of which are pretty funny, (Gotta love Vanessa Bayer and the guy with the baby fetish.) The movie manages to stay in the office for most of the way through, which keeps it grounded and on track. And while the plot does lose some momentum in the final portions of the film, it never wanders too far away from what makes it a success. Not a great movie, but definitely a pretty funny one. It’s a pleasant surprise to be able to say that Office Christmas Party is actually good. In the world of modern comedies, there are two kinds of movies these days… the ones that hold back and stay reserved (the Melissa McCarthy Ghostbusters,) and the ones that go all out, (Bad Moms.) Now this is not as simple as saying R rating vs not R rating, (plenty of R rated comedies are terrible, from Sisters to Why Him?) It’s just to say that the good movies are the ones that don’t settle and instead, they keep striving to be creative and smart. Comedy is a tough genre. It takes a lot to make the humor in a movie work, and some of the basic elements to this formula include an original plot, and a whole big cast of lots of colorful players. Office Christmas Party has both of those things going for it, and both of them are front and center throughout the course of the film. Let’s start with the plot. Branches of a bank are being shut down, left and right, by an angry boss named Carol Vanstone, (played by Jennifer Aniston.) We meet the employees of one of these branches as they spend the morning preparing for their night time Office Christmas party. Then we get a board meeting where Carol announces that she will be closing their branch down, just like those others. Oh, and the Christmas Party is cancelled. That’s the setup. Now it’s up to the employees of the branch to save the company. They propose a deal to Carol that if they can land the banks biggest potential client, Walter Davis, then she will let them stay opened. Their plan for landing him… throw the biggest and most outrageous office Christmas party imaginable and invite the client to come. Is it believable? Of course not. Even if the guy does come and has a great time, that doesn’t mean he’s going to sign with the branch and do business with them. But in the world of comedy, you rarely find a premise that is one hundred percent believable. What we do have here is a premise that is creative and fun. The casting in this movie is top notch. Now that’s not to say that it’s a bunch of A list stars, but instead, it’s a bunch of talented comedic actors all playing up to their strengths. It’s like a who’s who of comedians. From Saturday Night Live players like Kate McKinnon and Vanessa Bayer, to movie actors like Jason Bateman and Aniston, to great TV personalities like TJ Miller (Silicon Valley,) and Courtney B Vance, (American Crime Story: OJ Simpson,) this one is star studded. There’s Rob Cordry and Jillian Bell and even Olivia Munn. And while the movie obviously gets into some of their backstories more than others, (no way it could possibly do them all with this many characters in attendance,) every single actor in this cast gets the opportunity to be funny and to shine. Part of the reason why that’s able to happen is because each of these actors is playing up to their strongest abilities. Jason Bateman is best when he plays the average Joe kind of rational-minded everyman. Check. TJ Miller and Rob Cordry are great at playing the crazy party animals. Check. Jillian Bell is best when she plays the badass over the top role, (like she did in 22 Jump Street.) Even Kate McKinnon as the odd bird is great and Vanessa Bayer as the normal, but freaked out persona is great, (she hooks up with a guy who has s baby fetish and can’t seem to let it go.) All checks. Everybody here is doing what they do best, and pooling all their talents together, and it works out smoothly. But the heart of the story is with this mission to impress the client, and the man does show up at the party, but is not easily won over. There’s a lot of foreshadowing here, involving the Clay character. Early on, when looking at a raised bridge, he comments to his friends about what speed a car would. need to be driving at to speed all the way up the bridge and then jump across to the other side. You better believe this will happen later. Similarly, at the party, Clay raises the challenge of whether it would be possible to swing across the room by hanging onto the Christmas lights. This also ends up happening. While this is all a little too simple minded, when it comes to storytelling, at least it is all true to the Clay character, who at one point sleds down a staircase and goes flying straight off the end of the stairs. He’s a character, and TJ Miller has a lot of fun with the role. Regarding the plot, Office Christmas Party works for most of the way through. It starts to lose some of its momentum in the final act, when the characters do leave the party, but it’s no major landslide. Still, it would have been better if they never left. Considering that this is an all night Christmas party movie, it should have really stayed in that single location throughout it’s duration. Or at most, had the characters go somewhere the next morning to get breakfast or something, (like at the end of Can’t Hardly Wait, another one night party movie.) Still, even when the characters do leave, it doesn’t hurt the movie too much. After all, this is when Jillian Bell gets her chance to shine as the pimp / drug dealer kind of character she plays best. And while we end up leaving with the core group of main characters, we do check back in on the side characters, who are still at the party, quite a bit. Office Christmas Party works mainly because of how much it has going on, and how likable aand funny the characters are. This is no brilliant film to be sure. The plot is very basic, and doesn’t even try to be more. But the casting is spot on, the characters are great, and the film does stay at the party for most of the way through as new developments arise. We don’t just stay on the floor with the party, but are also with the security guard down on the first floor, and some characters who go out for a smoke, up on the roof. Nothing feels forced or cliched, (for example the Jason Bateman – Olivia Munn potential relationship is never put front and center,) and instead of focusing on storytelling, (and most likely not being successful with it,) this movie makes humor it’s number one priority. Consider that the film has comedians to spare, as witnessed by the Rob Cordry character who is crazy guy number two, taking a backseat to the TJ Miller character. This movie might not be the brightest bulb in the shed, but it is entertaining and funny and definitely does the trick.